Weddings receptions are done in every theme imaginable. Watermelon and fruit carvings can add to the theme’s decorations. Today’s post features some wedding reception carvings that customer/student Cindy Rozich created to fit a Western theme. 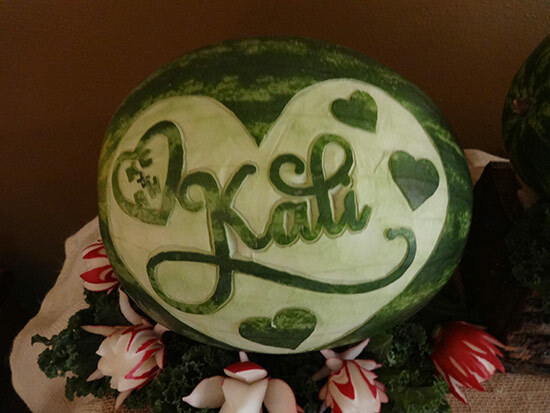 Customer Student turned pro, Cindy Rozich, carved these watermelons to fit the Western theme of the wedding reception. 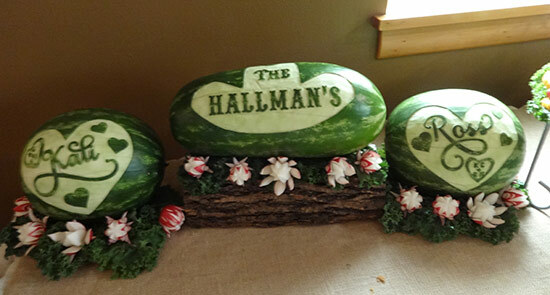 The carved watermelons were for a western wedding reception at the Cross Eyed Moose Event Center in Homeworth, OH. I enlarged the font from their invitation to make the pattern for Kali & Ross’s names. The heart with their initials carved in it was on a tree on the invitation, so I included it on both carvings. I chose a western font for their last name which fit perfectly in the cowboy hat shape. I hope you enjoy! I do enjoy, Cindy. Thanks for sharing your photos with us. Cindy matched the font used in the invitation and added the carved initials that were also on the invitation. You can learn to carve words like these wedding reception carvings in our video lessons, Carving Letters and Words. 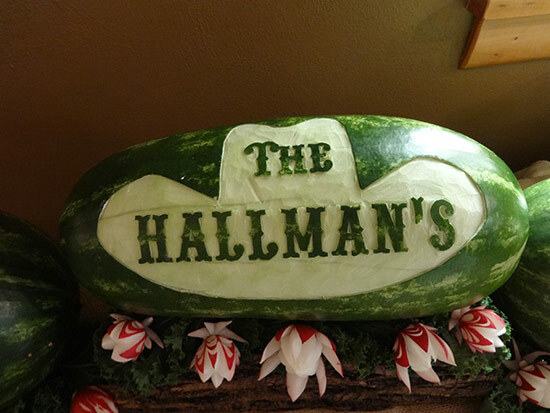 “The Hallman’s” was carved in a Western Style font and was centered within the outline of a cowboy hat. Cindy elevated this center melon on a log to fit the Western theme. 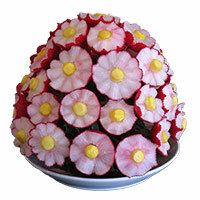 She added radish flowers like the ones taught on our video lessons, Amazing Carving with Jimmy Zhang. 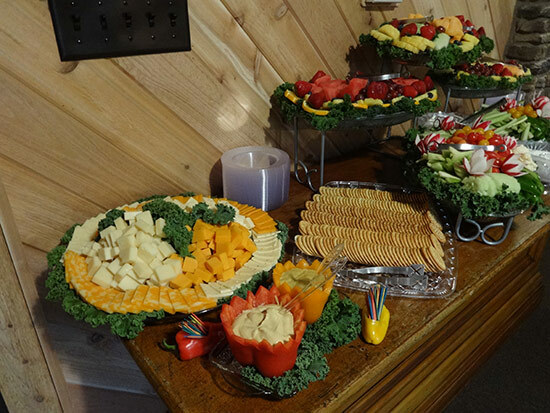 Cindy also did the fruit and vegetable trays. The reception for 200 was held on 2 floors. The pictures below show the appetizer table on the bottom level. The pictures with the watermelon carvings were on the appetizer table on the upper level. I did all the fruit and vegetable trays. The cookies were ordered from a local bakery and the cheese was from my families farm market. The 6 fruit trays weighed a total of 60 lbs. and the 4 vegetable trays weighed a total of 29-1/2 lbs. It was a lot of work, but it was fun! 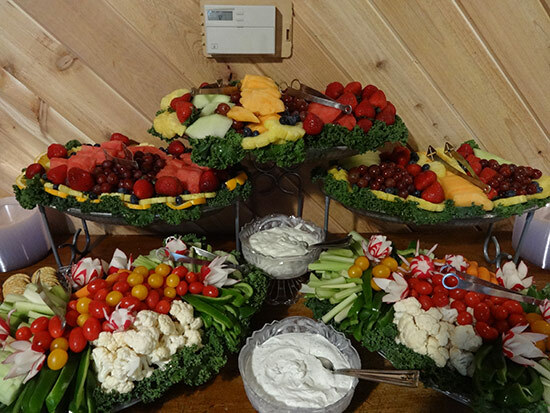 Notice how Cindy elevated her platters to make a pleasing looking layout for her fruit and vegetable trays. Cindy carved some peppers to use as dip holders. It was her clever idea to use little bell peppers as toothpick holders! The wedding was held on at the Cross Eyed Moose Event Center. It was originally a church, which was turned into a lodge type event center. It is decorated with high end antiques and is absolutely beautiful, just stunning! 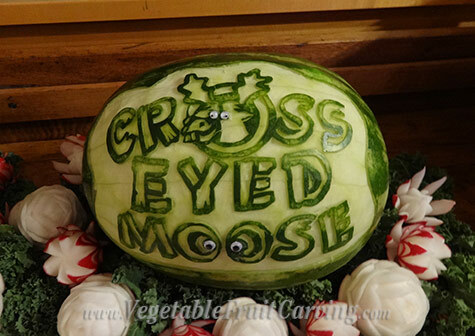 Cindy carved this watermelon because the wedding was held at the Cross Eyed Moose event center. The googly eyes that she added are perfect to match the name of the center. Cindy did a beautiful job of making wedding reception carvings to fit the western theme of this wedding, didn’t she? 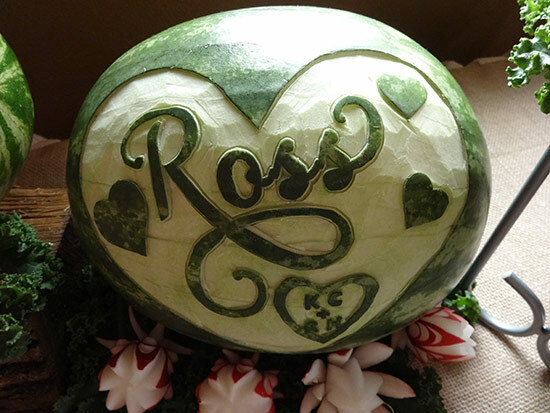 Perhaps these photos will give you some ideas and inspiration for carving custom melons for your next special event. You can learn to make wedding reception carvings with our video lessons, Carving Letters and Words. 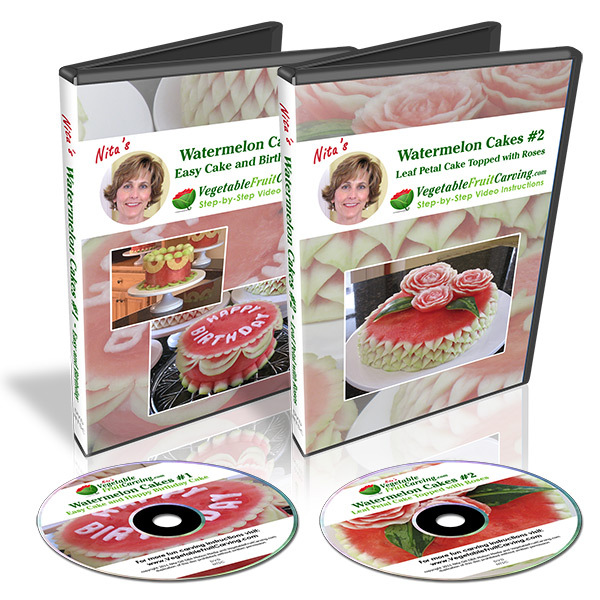 These lessons are great for carving customized melons (or pumpkins) for any special event. Our time-saving pattern transfer fabric is the best way ever to transfer your patterns onto your melons and pumpkins before carving. You can learn more about our Pattern Transfer Fabric by clicking here. You’ll LOVE IT! 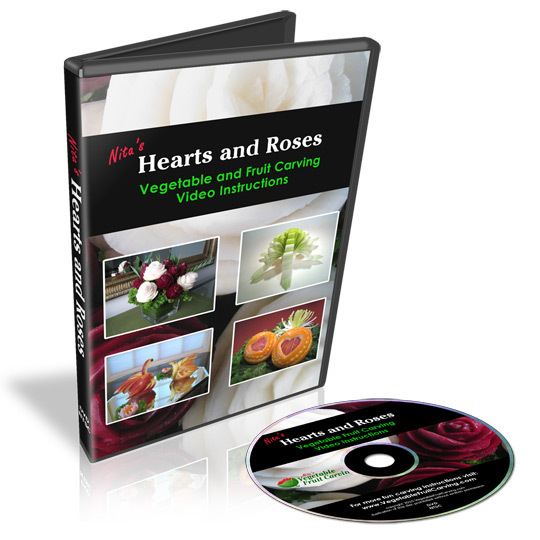 Nita, you are an amazing awesome teacher and I love all your videos! Carving is so much fun. I really enjoy it! Thank you Cindy. And thanks again for sharing your photos. Thanks, Anita, I always admire your wonderful ideas and work. One day or another I will find the time to learn how to carve letters and images, since I am a runner I would love to carve figures of runners in action. Something about running any way! Also something related to sports for young children, One Day! And here are some bicyclist carvings. https://www.vegetablefruitcarving.com/blog/logo-carved-watermelons/ I know these are not running but still a sport. You might find them inspiring. Thanks so much Nita, you are a lovely person. Thanks for the kind words Yemi. Gorgeous display!!! Hope to see you back at the Cross Eyed Moose Event Center! Such a gem of a venue!